Robert Shiller (Nobel Prize winner for economics in 2013 and Case Shiller are noted and often quoted real estate research gurus. 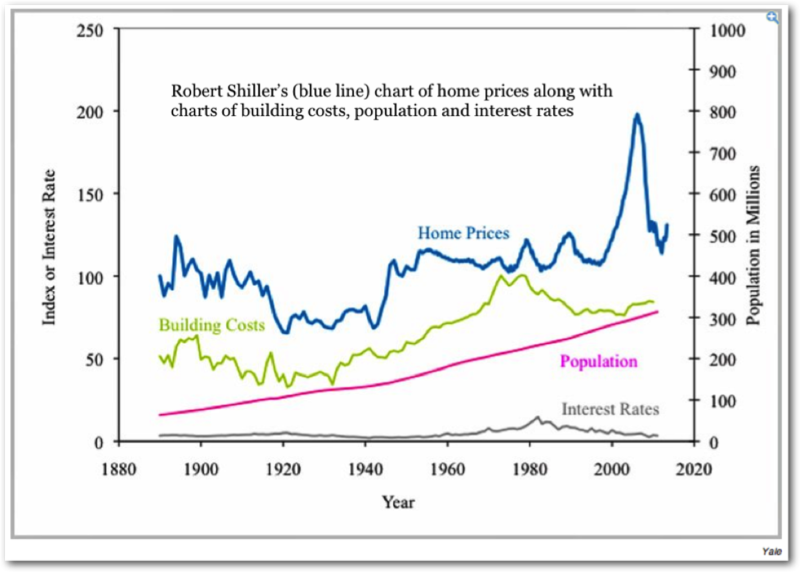 This is Robert Shiller's chart showing an "average home" that he indexed to $100,000 at year 1890. 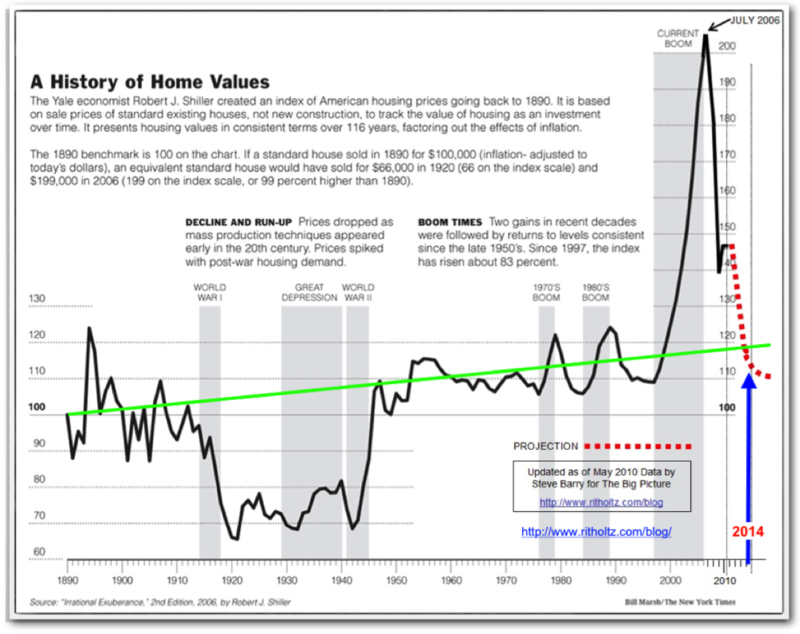 He then, adjusting for inflation, charted the value of that home over time allowing for events that would affect the value. Obvious ones were wars and depression and a couple booms. The blue line is a trend line from 1890 to 2000. Now what happened from 2000 on? Wow, HUGE run up in value. Why? Well, look closely when it started. Roughly the mid-nineties. This is when our government (specifically Clinton and Frank) decided that everyone deserves their own home and started putting pressure - BIG pressure - on lending institutions to give mortgages to basically anyone regardless of ability to make a normal house payment. This was the start of the NINJA sub-prime loans. NINJA = No Income - No Job and no Assets. i.e. banks needed to start lending to folks they were turning down previously. Banks developed the sub-prime loans with teaser payments (i.e. based on a 1-2% variable rate) or even NO payments (reverse amortization!) that allowed someone to get in cheap. Also, was the start of 100% mortgages for those who didn't have a down payment. I own rental houses. In 2003-4-5 and 6 I was having trouble renting because I required a damage deposit of $1,600 and the first months rent of $1,500 - a total of $3,100 before a tenant could move in. I had potential renters tell me that I was crazy. They could buy a newly built home and move in now with NOTHING out of pocket and no payment for 55 days or so. And that payment would be less than the payment I wanted for rent. I would point out that the $1,200 payment was a teaser payment and that it would increase in 3 or 5 years when it reset. The potential renter said "Well, we'll just deal with that at that point." I pointed out that the payment could easily be double or more. They responded, “If we can’t make the payment the we'll just give it to the bank. We still live cheaper for those years than renting. Besides the houses are going up in price. We'll just sell and make lots of money.” Well, they had me there. Then I realized that they didn't care what the house cost - they were buying payments. Now I ask: If a buyer doesn’t plan on paying for something, what do they care what it cost? The builders learned quickly - a high price with low payments and they will still buy. Appraisers were pretty liberal with the values they brought in if they wanted the next job from the mortgage broker. This sale worked easy so the price went up and up and up. UNTIL the loans started resetting and those who waited too long to sell couldn't sell and could not make the payments and foreclosures started hitting. As foreclosures hit, the prices went down and more and more folks went "upside down" and got foreclosed. And... now here we are. That’s where we were. Now look back at the Shiller chart - the red line at the right. The arrow is today. Yep, we are right on schedule. Prices are continuing to drop here in 2012. Foreclosures are not cleaned out yet and Robert Shiller thinks it will be 2015 before we hit bottom. I agree. Look at my Foreclosure Chart page and you’ll see why I agree. Marketing Your Luxury Property Internationally!